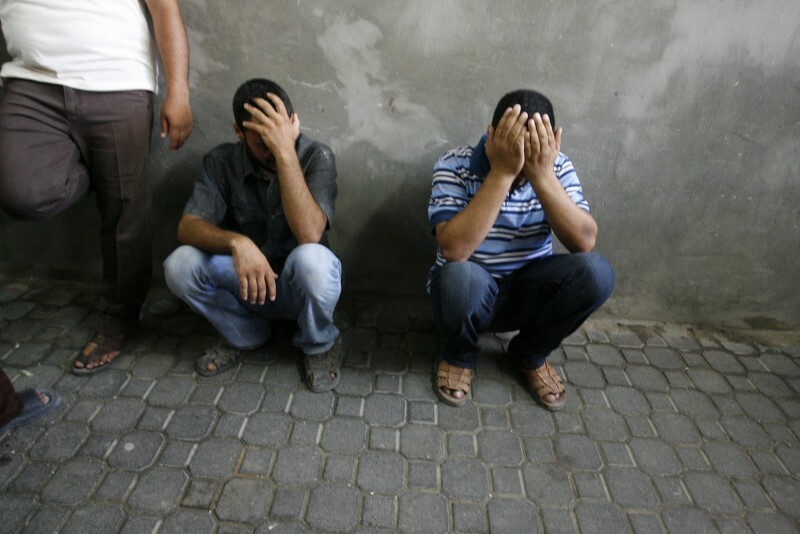 Relatives mourn at a hospital following an Israeli air strike that killed three members of al-Shair family, in Khan Yunis in the southern part of the Gaza strip on July 20, 2014. On August 26, Israel and the Palestinian factions agreed to halt fighting indefinitely, putting an end to seven weeks of catastrophic destruction and loss of life. At least 2100 Palestinians have been killed, more than 10,500 injured, and 520,000 displaced, since Israel launched a massive offensive called Protective Edge against the 40-kilometer-long coastal strip on July 8. This is Israel's third military operation in Gaza in six years. Excessive restrictions from Israel in the Palestinian territories of Gaza and the West Bank aggravate conditions in an area that most of the world and the United Nations considers occupied by Israel. Some estimates say 40 percent of Gaza's urban area has been reduced to rubble. 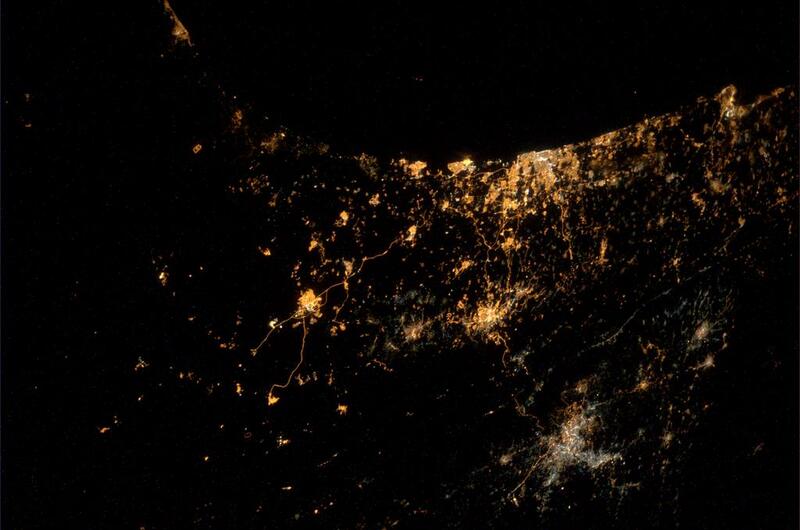 Israel attacked the only power plant in Gaza on July 28, plunging the congested strip of 1.8 million people into darkness while putting its limited water and sanitation infrastructure under crippling stress. Israel, Hamas and Islamic Jihad, the main militant groups in Gaza and the Palestinian Authority, which governs the West Bank, the other Palestinian Territory, agreed on an open-ended ceasefire beginning at 7pm on August 26 in Gaza. Under the ceasefire Israel will open its border to allow humanitarian aid and construction material to enter Gaza, and will extend permitted fishing zone to six miles off the coast of Gaza. The Rafah border between Gaza and Egypt will also be opened. This open ended ceasefire follows six short-term humanitarian ceasefires, three of which collapsed within hours. The last one started on August 13 and ended on August 19 as Israel carried out a series of airstrikes across the Gaza Strip in response to renewed rocket fire from Palestinian militants. Seventy-two percent of Palestinians killed in this offensive have been civilians according to the UN, which has raised questions about the tactics and targets being used in Israeli strikes. Israel has bombed residential neighborhoods, schools, a playground, hospitals, shelters and refugee camps. One of the reasons coverage of this conflict has been so tilted in mainstream media is because of Israel's sophisticated propaganda machine. While war raged on the ground in Gaza and across Israeli skies, there was an all-out information war being waged on social networks. Since August 13, Israeli and Palestinian factions have been in negotiations in Cairo for. Israel demands include an end to rocket attacks, the demilitarization of Gaza and disarmament of Hamas, a group that has ruled Gaza since 2007 under a seven-year blockade from Israel. Hamas wants Israel to lift the seven-year blockade. They also want the release of about 125 key political prisoners held in Israeli military prisons. Since Israel began it's assault on Gaza a month ago, Israel and Hamas committed to six ceasefires. The first three ceasefires collapsed within hours. Israeli airstrikes on the battered narrow 25-mile coastal strip resumed after the last 72-hour humanitarian ceasefire ended on August 8. UN shelters are struggling to accommodate more than 250,000 Gaza residents who are fleeing the violence or whose homes have been destroyed by bombings. Six UN shelters have come under attack by Israeli forces. Israel says the assault is targeting Hamas for firing hundreds of rockets across the border into Israel. Since the offensive started, three civilians have been killed in rocket attacks on Israel and 64 Israeli soldiers have been killed in fighting in Gaza. As low-tech rockets leave Gaza, most of which are neutralized by Israel's Iron Dome defense system, Hamas vows to continue fighting against Gaza's “slow death” and demands an end to the Israeli blockade of the strip, which has crippled Gaza's economy, civilian infrastructure and water supplies. Earlier this year, the UN warned that Gaza would not be livable by 2020. Before this offensive, unemployment in Gaza was at 40 percent with 80 percent of the population dependent on humanitarian aid. The last ceasefire in November 2012 was supposed to ease the blockade, but Israel only intensified it. Israeli journalist Gideon Levy maintains that any future ceasefire depends on whether the United States and others pressure Israel to end their blockade of Gaza. Israel and Hamas agreed to a 72-hour humanitarian ceasefire on August 1 so Gazans could bury their dead, take care of their injured, and restock food supplies. The ceasefire was violated after 90 minutes in the town Rafah. Dozens of Palestinians were killed and hundreds more injured in shelling in Rafah, where a hospital and UN school was also targeted by Israeli forces. Israel and the U.S. blamed Hamas for breaking the ceasefire by capturing a soldier after the ceasefire, but 48 hours later following dozens of bombings across Gaza that killed hundreds, Israel said the soldier was never captured and was killed in combat. Hamas’ militant wing maintains they engaged with Israel soldiers in Rafah before the ceasefire. Another brief humanitarian ceasefire was attempted on August 4, but that too was violated almost immediately with both sides blaming each other. Palestinian civilian deaths are mounting, according to the UN. A video showing four young Palestinians boys being shot down by sophisticated Israeli aerial weaponry while they were playing on the beach shocked the world. Hamas’ rockets are mostly homemade and reaching further than ever before, but most of them are picked off by Israel's Iron Dome missile defense system and rarely cause damage. Sirens warn Israelis of incoming missiles, and they can take shelter in one of the country's many bomb shelters. In Gaza, there are no sirens or bomb shelters, the Israeli Defense Forces have been using one-minute missile tap warnings on residential houses in this offensive. Israel's military has bombed residential neighborhoods and shelters in Gaza. Many women and children have been killed, and the strip's tight supply of medicine and equipment complicate efforts to treat the wounded. The military says it has warned Gazans living in targeted areas to leave, but Palestinians have no where to go. The bombardment began after the kidnapping and murder of three Israeli teenagers in the West Bank in June. After the teens went missing, Israeli authorities withheld crucial evidence from the public that suggested the missing boys had been killed. Officially Israel continued to blame Hamas for the kidnappings of the Israeli teens in the West Bank. Hamas denied involvement. Meanwhile thinking the teens were still missing, Israelis launched a massive #BringBackOurBoys social media campaign and the state launched an operation to search for the missing boys, during which hundreds of Palestinians were arrested and several killed. The case also sparked a revenge attack on 16-year-old Palestinian Mohammed Abu Khdeir, who was burned to death. Two weeks into the offensive a few different Israeli officials acknowledged that Hamas was not responsible for the abductions and killings. In response, Hamas increased its rocket fire at Israel, and Israel began a campaign of aerial bombing on Gaza. Israeli ground operations began in Gaza more than a week later. Mainstream media has faced criticism for characterizing the conflict as a fair fight and for downplaying Palestinian deaths. The New York Times came under scrutiny after it changed its headline, “4 Young Boys Killed Playing on Gaza Beach”, about the bombing of a beach that killed four Gazan children who were playing football, to “Boys Drawn to Gaza Beach & Into Center of Mideast Strife.” Some thought the revised headline shifted blame for the boys’ deaths away from Israel. As scenes of death and devastation circulate online, Israel has redoubled its propaganda in an attempt to show the world through YouTube videos and official accounts on Facebook and Twitter its kinder side. Today’s media strategy includes dozens of infographics and visualizations that attempt to depict Israel’s rationale in a graphic and simple manner similar to that employed by the award-winning Visualizing Palestine project, which focused on visualizing the effects of occupation for Palestinians in Gaza. From Visualizing Palestine Facebook page. 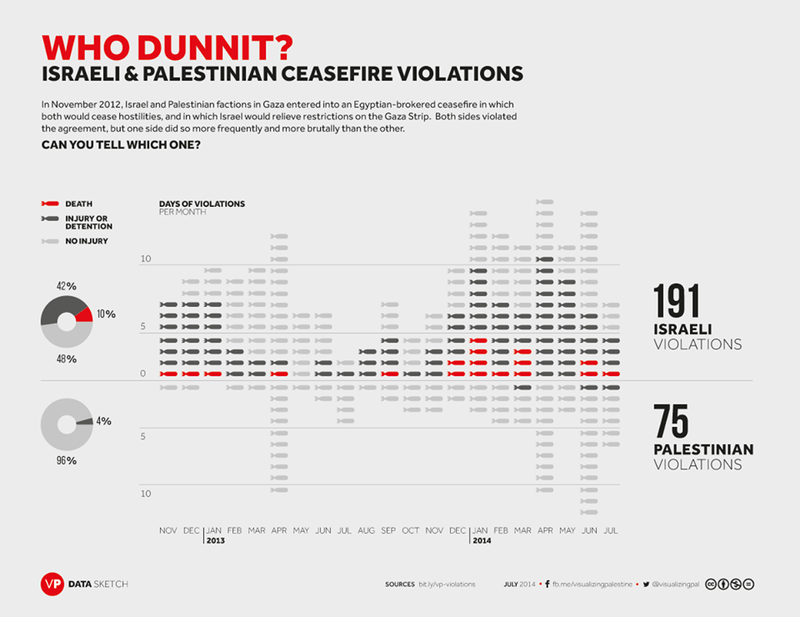 Visit http://bit.ly/vp-violations for the raw data behind this data graphic. Online expressions of hate and callousness toward Palestinians haven't helped Israel's cause. Photos of Israelis watching and cheering the bombing of Gaza have made the rounds of Twitter. Shortly after the three Israeli teens were kidnapped, a page called, “Until our boys are returned – we will kill a terrorist every hour” appeared on Facebook. It features multiple posts in Hebrew calling for violence against Palestinians and Arabs. Despite many formal abuse reports made by Facebook users, the page, which has just under 21,000 likes, has not been taken down. Not all Jewish people support the offensive against Gaza, but the violence has sparked incidents of anti-Semitism in Europe and elsewhere. 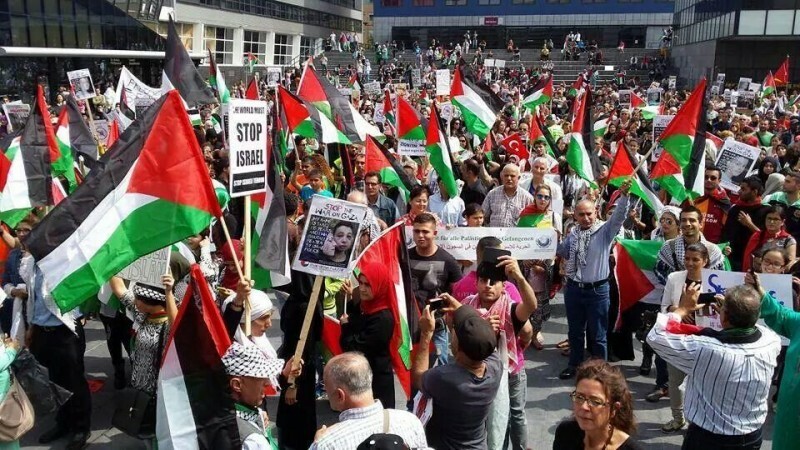 In Turkey, there has long been considerable sympathy for Palestinians among Turkish people in all walks of life, but the Gaza bombardment is now being used as a pretext to openly embrace anti-Semitism. The Hague, Netherlands – July 12, 2014. Around the world, people have called for an end to the deadly assault. Ceasefires have come and gone, and while some say the relationship between Israel and Palestine seems irreparable, others are still holding out hope and working for peace. When it comes to Israel and Palestine, the arguments get really heated on both sides. This conflict is more than 66 years old. Here's some additional information on the conflict from some of our friends. 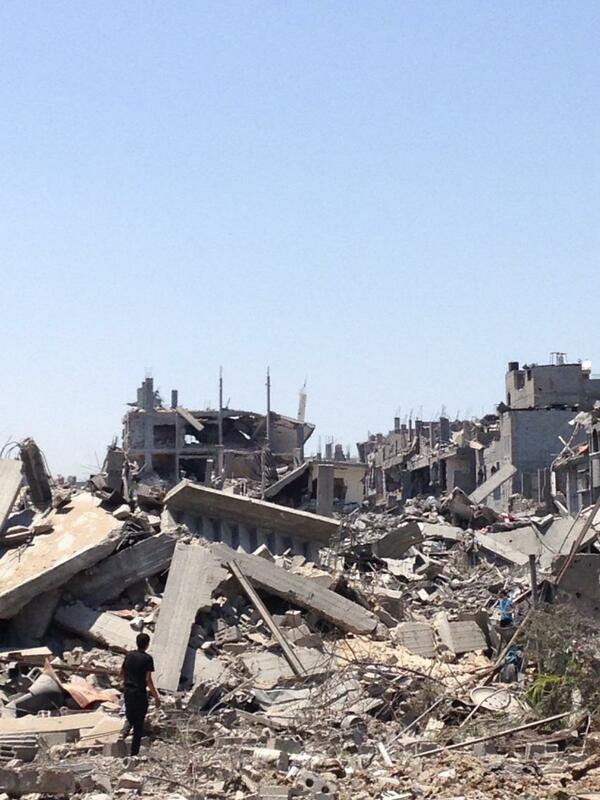 Gaza is not as I expected. Amid the terror, there is hope, opinion piece by The Guardian's economic editor Paul Mason after returning from war-torn Gaza. What Does Hamas Really Want? Democracy Now's Amy Goodman interviews Israeli Journalist Gideon. Everything you need to know about Israel and Palestine from Vox, a US-based digital news company. Who Bears More Responsibility for the War in Gaza? Historic backgrounder from the New Republic, an American news site which says its subscribers are some of the most educated and influential people in the country. Israel/Palestine video explainers from AJ+ labs, AlJazeera's new digital-first initiative. Heatmap created by Al Jazeera's The Stream follows social media trends since the Israeli teens went missing. Five Israeli Talking Points on Gaza—Debunked One of the reasons coverage of this conflict has been so tiled in mainstream media is because of Israel's sophisticated propaganda machine. This piece by the Nation debunks their biggest false claims. Gaza coverage from Mondoweiss, a US-based news site from a progressive Jewish prospective. Electronic Intifada is an independent online news publication that focuses on Palestine, its people, politics, culture and place in the world. #GazaUnderAttack coverage on Middle East Eye or MEE which is an independently funded online news organisation. B'Tselem – Updates from the Israeli Information Center for Human Rights in the Occupied Territories. Palestinian Centre for Human Rights – Daily reports on human rights violations in the Occupied Territories. @HadeyaKuhail – Palestinian mother and wife tweeting from Gaza. @palinoia – Gaza-based female blogger. @Elizrael – Tel Aviv-based Global Voices author tweeting about protests against the offensive in Israel. Naomi Wolf - The award-winning Jewish American author is moderating debates on Zionism on her public Facebook page. 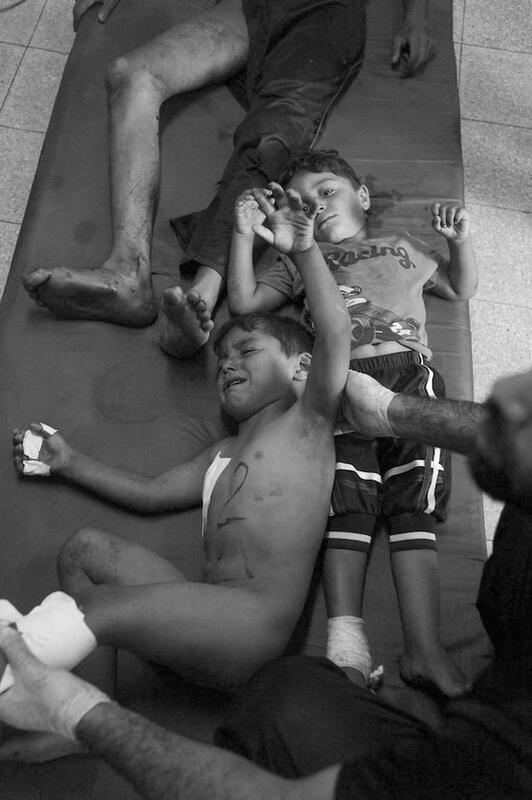 @DrBasselAbuward – Gaza-based doctor is tweeting between shifts and under bombs. @Belalmd12 – Gaza-based doctor tweeting between shifts and under bombs. @drsaeedkanafany – Gaza-based doctor tweeting between shifts and under bombs. @ChrisGunness – UNRWA Spokesman advocating passionately for Palestine refugees. .. and more in our curated Gaza 2014 Twitter list.